Wow. That is effed. Where do you order these mysterious hybrid bolts if you need a replacement? did you know porsche did the same? Talked to the shop, they feel a 224* is as much as I can go and be sure to pass emissions. 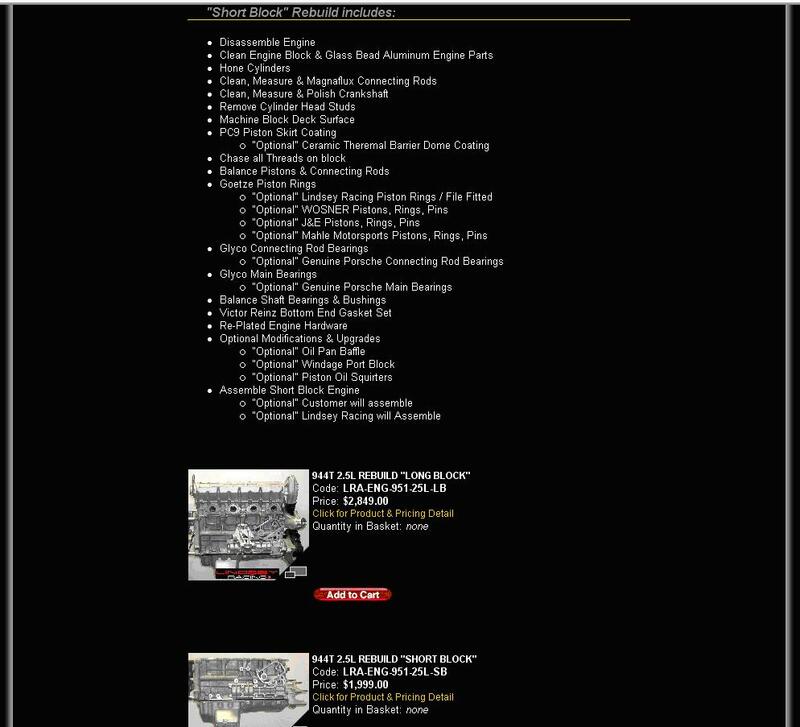 Where should I order the double roller timing chain and oil pump from? When do you replace the water pumps on these motors? My motor has 64k miles on it, should I replace the water pump now? well, I know on the LT motors, I've seen water pumps last for oh, 90-120K. so I think you're good. but while your in there it shouldn't hurt. BTW. bring it to me for service! 224 doesn't tell us anything about the cam timing. You need the cam card. Post the cam card online and we can take a look at it and tell you what's up. If you're running cats and you have a wide LSA, you won't have a problem. since it was Texas DPS flagship motor for several years. Intake Duration: 222 Degrees at .050" Tappet Lift. Intake Lift: .597" with 1.7 rockers. Exhaust Lift .598" with 1.7 rockers. 224/224 .581/.581 Camshaft With Your Choice of Lobe Seperation. I would guess that the first one would be tough to pass emissions with. If your criteria is must pass emissions the cam manufacturer will know best..... if they can't tell you go to a different manufacturer. I know your in a hurry Doc, but if not passing emissions really is a showstopper take a little time and do a little homework. I called the cam manufacturer and the 1st cam should pass. So I ordered it along with springs, pushrods, gaskets and a double roller timing chain..
[QUOTE=docwyte;7816994]I don't think it's shameful of CPR at all and I happen to agree with him. It's very disengenous to advertise a price for a "rebuilt" short block and then read in the fine print that it's not assembled! That's not a rebuilt short block, it's just the parts TO rebuild the short block. Actually, there is nothing disengenous about it at all. Like buying a new car, you start with the base price and add options and accessories. Assembly is an option just like adding a stouter connecting rod. There is a bright yellow link saying click for pricing and details. The first option in ALL CAPS asks you if you want it to be assembled and tells you how much extra that is. So if you can read, and we give our customers that credit, you don't have to read but the first sentence. Nothing hidden, nothing disengenous. You "cannot" make the purchase on the site without being confronted with answering that question and others, so there are no "buy now, get surprised later" issues here. You just need to be able to read. The confusion comes when looking at rebuilt short blocks the assumption is it that it comes assembled. While it is listed that assembly is an additional charge and yes, we can all read, it's still a surprise. The fact that I'm not the only one who was confused and surprised by it means it could be listed or explained more clearly on your site. First off I appreciate what you do for the community, but this small portion of your site could use some clarification. “Assemble Short Block Engine” So it almost reads as the $1999.00 would provide an assembled Short Block and the Customer will assemble would be a $600.00 reduction in price. In reality you’re offering a Small Block machining and parts prep service. There really is no “Rebuild” for the advertised $1999.00.